Critters that live in conch shells do not readily give up their homes. 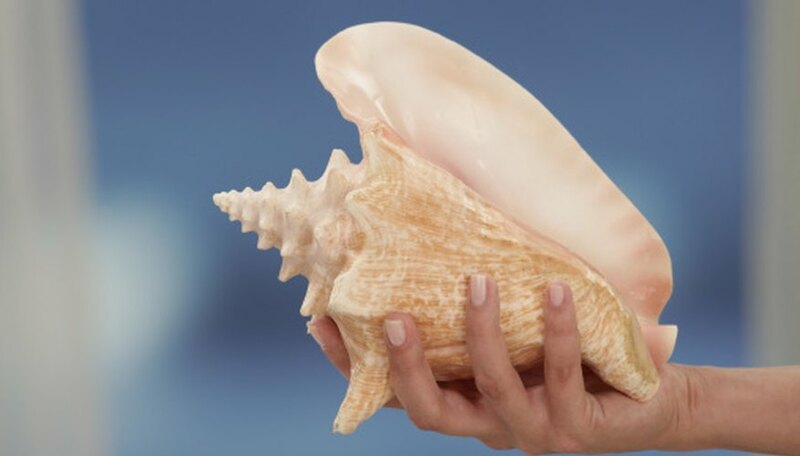 To remove a conch, you'll need to make a hole in the shell and use a knife to break its grasp on the shell before you can pull the whole creature out. Once you do this, prepare the conch by removing its head, intestine and orange “skirt.” Skin and clean the conch and cook it battered tempura style or add to it salads. Position the shell so that the side with the spirals is face-up. Place your finger in the center of the spirals and count the spirals going outward. Locate the space between the third and fourth spiral. In that same space, locate the third point upward from the flare, or lip of the conch. Make a hole in the space you located by pounding it gently with a masonry hammer. Stick a paring knife through this hole and “feel” around with the knife until you touch the conch's hard muscle. If you can only find soft tissue, make another hole one point up from the first hole and try again. Cut through the muscle to detach it from the shell. Grasp the foot, or claw, of the conch. Pull the conch out of its shell. Check with your local or state government to ensure it is legal to catch conch. They may be protected in some areas.